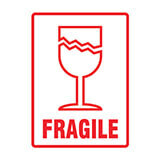 When you entrust fragile or easily damaged goods to the post or a courier, you need to know that anyone handling your parcel knows that they have to do so carefully. 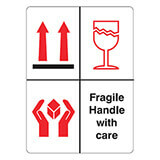 Our range of shipping labels has been designed to ensure your handling message reaches who it needs to clearly, to give your product the best chance of reaching your customer safely. These labels are kept in stock, so we can dispatch them to you the same day we receive your order – and don’t forget that if you stock up, you could save up to 20% with our famous and very generous quantity discounts. Whatever the message you want to get across to your customer or courier, chances are you’ll find it here. 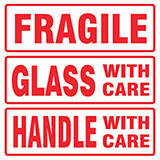 From simple, popular and very important messages like Fragile and Handle With Care to things like Urgent, Do Not Crush and Documents Enclosed, all our shipping labels are printed either red or black on a white background to ensure they are quickly and easily seen. 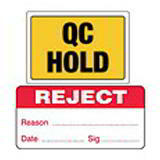 We’ve also included a selection of Quality Control messages, like Inspected, QC Pass and QC Reject, so you can ensure that your customer gets only those products you want them to – and tells him or her that you take the quality seriously at the same time!